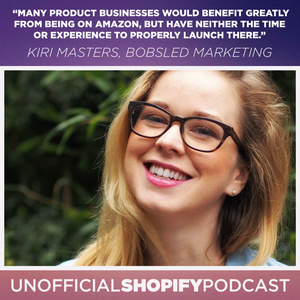 Kiri is the CEO and founder of Bobsled Marketing, an Amazon marketing agency that has changed the way businesses sell and promote their products in the online marketplace. The agency was launched in 2015, following Kiri’s own entrepreneurial efforts on Amazon with her own brand, I Like That Lamp. Trying and testing tools and strategies with her own brand, Kiri realized that many product businesses would benefit greatly from being Amazon, but have neither the time or experience to properly launch their products there. At the core of Bobsled Marketing’s success is a self-designed, self-tested, comprehensive process that Kiri created to launch and optimize product listings on Amazon with a clear objective: to drive maximum revenue through the channel. To-date, this same process has been replicated by the Bobsled Marketing team for over 200 products across most product categories on Amazon. Bobsled Marketing had humble beginnings. In July 2015, Kiri was doing piecemeal freelancing projects for consumer goods companies who needed help with maintaining and growing their sales on Amazon. Soon, she took her business to a whole new level. Kiri identified an overlooked opportunity amongst crowdfunded brands, which needed to quickly develop sales & distribution channels after their Kickstarter campaign ended. This niche approach has boosted Bobsled Marketing into one of the go-to Amazon marketing agencies for established brands in less than a year, offering new opportunities, both for new businesses and for digital professionals looking for the right company to harness their extraordinary analytical skills. Kiri’s company grew to more than 10 staff, and manages 7 figures per month in sales on the Amazon marketplace for more than 30 clients. These clients now range from crowdfunded hardware startups and large European manufacturers to a billion-dollar consumer brand. Why should brands consider launching their products on Amazon? What are the top things that brands do wrong when they launch on Amazon? What does Amazon cost? What does that get?